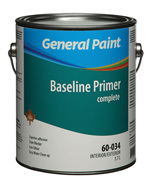 Product Description: An interior/exterior waterborne alkyd/acrylic hybrid primer designed to be used on a wide variety of substrates including new wood, ages alkyds, prepared galvanized steet, aluminum, masonary, concrete, plaster and drywall. Application: Brush, roller, air or airless spray. At time of application and for 8 hours thereafter, temperature of the surface and air should not be below 10'C (50'F) nor relative humidity above 80%. Clean-up: Clean tools and equipment immediately with warm soapy water. A final rinse with Mineral Spirits may be required. Surface Preparation: Surfaces must be clean, dry & free ofany loose matter or other contaiminants. Abrade glossy surfaces to a dull finish before application.